During the Disney Wonder’s first guest sailing after dry dock, a new Animation Magic menu debuted. 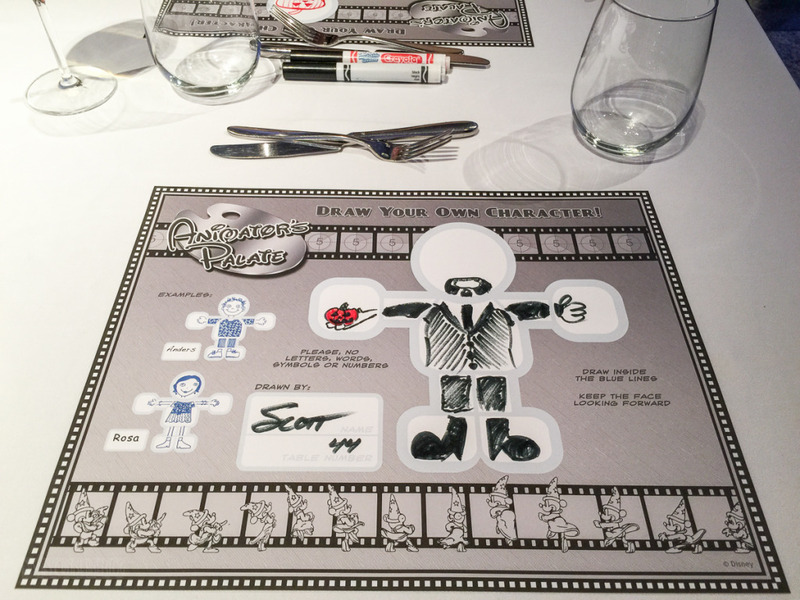 The Animation Magic dinner show begins when guests arrived and are invited to draw a character on the placemat with the provided marker. You can read more about the Animation Magic show in this earlier post. In order for the show to go as scheduled, the pacing of the dinner is scheduled so it is important to arrive on time as the first two courses are fixed to allow guests to design a character and the serving teams to get the placemats processed for the show. Now on to the menu that debuted during the November 10th Disney Wonder cruise. Special thanks to Tammy at StorybookDestinations.com for sharing the menu. The menu is a variant of the Sea Ya Real Soon menu as this was served on the final night of the cruise. with Linguini Pasta, Roasted Cherry Tomatoes, Artichokes, Sautéed Baby Spinach and a Tomato-Basil Provençal Sauce. This entry was posted in Menus and tagged Animation Magic, Disney Magic, Disney Wonder by Scott Sanders. Bookmark the permalink. I absolutely hate the fact there is no multiple app and soup and salad selection. I can’t stand seafood so no app for me. DCL needs to rethink this fast. Alan, this has been the way during the Animation Magic dinner since it first debuted on the Disney Fantasy. Well there is also duck confit, which isn’t seafood. You could skip the appetizer and save room for two entrees. Or have an extra piece of the bread service. Right there with you Alan !! !…or mushrooms or Lamb. Thanks…. but I so hope this won’t be the same on all the ships. 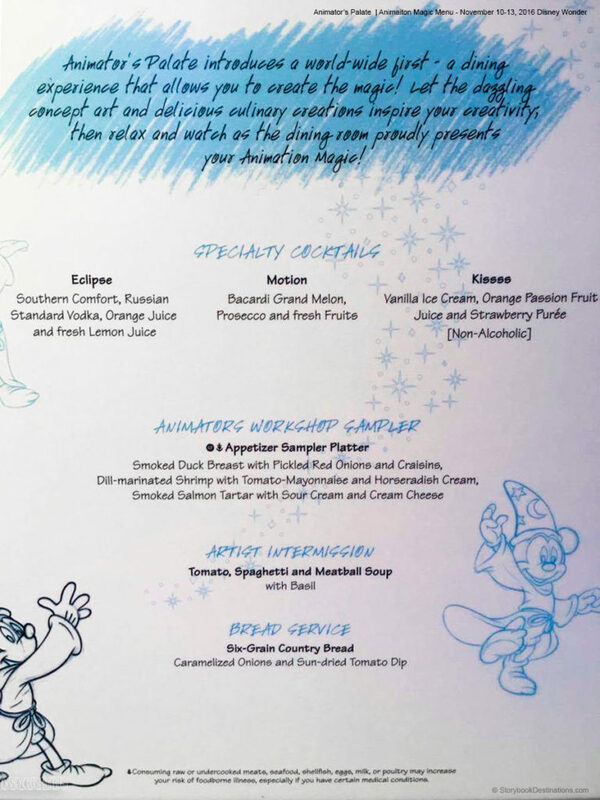 This looks identical to the menu on the Magic in the summer – we really enjoyed the Animation show, but I hope they switch the menu up for next year – we are on it again! 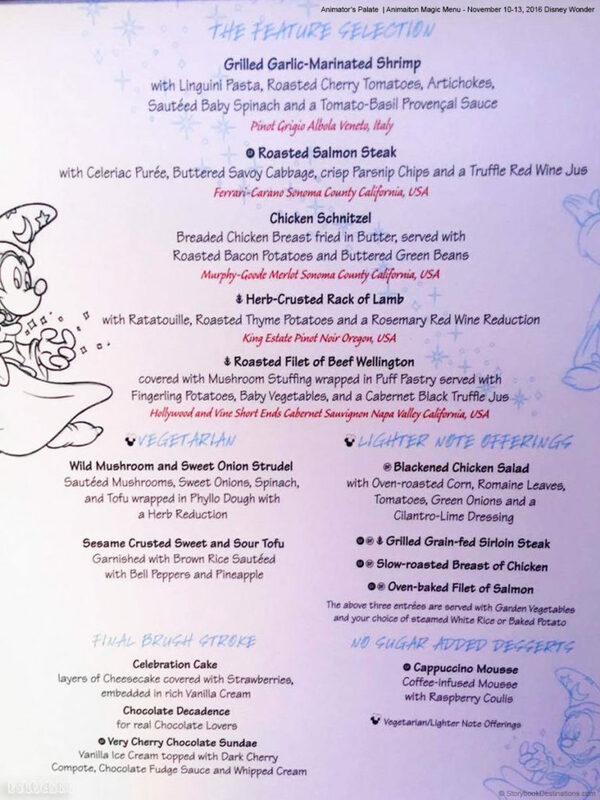 The menu on Animation Magic night is an abbreviated version of whatever menu is being served in all the dining rooms that night. They only serve one appetizer and one soup. And there are only 2 choices for dessert. The entrees remain the same. This one is the one for the night that the See Ya Real Soon menu is being served (the last night). Those people in Animator’s that night get this pared down menu. This looks almost exactly like the menu I just had on the Fantasy at Royal Court on our last night. I had the shrimp, one of my table mates had the schnitzel, and several had the beef wellington. The shrimp was one of my favorite dishes of the week. We thought the chocolate decadence was disappointing. Our menu did not have the spaghetti soup though. It had lobster bisque which was terrible! It smelled bad, was brown, and tasted like beef broth. One bite was more than enough. So this isn’t the rotation night show or menu. So a 3 night cruise would not have it? Typically only have it on the longer cruises? Kevin, historically the Animation Magic show has only been offered not the Magic during the longer sailings when guests are in each restaurant two or more times. I suspect this is only being done on these first few voyages out of Galveston because DCL has a bunch of invited media and travel professionals onboard previewing the changes. This looks like a newer version of the “til we meet again” menu. Im guessing the sweet temptations trio is gone? It wasn’t on the Tiana’s place menu either. Ambi, the starters will always be the same. The main and desserts would mirror the nightly dinner such as Til We Meet Again. What happened to the Sweet Temptations Dessert? I always get that so I can have a sampling of each of the desserts (which are my favorite part of the meal LOL). 10 of us enjoyed the Koool artistry, animation, technology!